Childhood years are supposed to be the magical years, but let us suppose your parents reject you at birth because they think you are “too ugly” to be a part of their lives. You would feel sad, wouldn’t you? This is a true life story of someone who was rejected at birth but stayed positive. 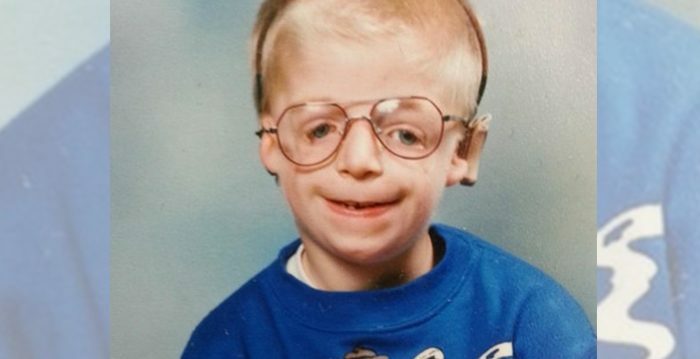 Jono Lancaster, now in his mid 30s, has Treacher Collins syndrome—a genetic disorder that affects the facial bones’ development while in the mother’s womb. There are no cheekbones, so the eyes droop down. Apart from having hearing and eating issues, Treacher Collins syndrome sufferers exhibit normal intelligence and develop normally. Lancaster was abandoned by his parents 36 hours after his birth. He was left at the Social Welfare. Then a wonderful woman named Jean Lancaster adopted Jono and raised him. “I used to hide how unhappy I was from my mom. She had already done so much for me,” he told the BBC in an interview. When Jono was a teenager, he really became very rebellious, not because he was a bad person, but because of his pain. He would do things to attract attention and that would deter people from the real problem: his physical features. He used to bribe people with sweets so they would like him. He used to drink a lot. Then came the turning point; when Jono was 19, the manager of a bar that Jono often visited took interest in him and offered him a job. Jono said that he was so anxious before a shift he would be dripping with sweat. In the meantime, he completed a diploma in sports science and a fitness instructors course. Jono found a job in a gym, and the people there took an instant liking to him. He said that it was a challenge to him, as gyms have wall-to-wall mirrors. While working at the gym, he met and fell in love with a beautiful woman, Laura. They became inseparable. Jono and his girlfriend Laura Richardson. They met at the gym. ”I just feel so relaxed in her company,” Jono said in a BBC interview. Jono and Laura bought a house together in Normanton, West Yorkshire. The couple have busy lives, and Jono now works as a team leader for adults with autism. He believes everything has a reason. Mr. Lancaster is devoted to bringing awareness to the public about Treacher Collins syndrome and how to deal with it. Although his biological parents still refuse to acknowledge him as their son, and it still hurts him, Jono has learned to accept it. He still faces many social challenges, but he is learning that by having a compassionate heart, one can change people’s minds. He was resentful when he was younger, but now he has found himself. Doctors always ask him if he would like to have some more constructive surgeries, but he has declined them gracefully, saying that God made him this way, and that he is proud of who he is. Your never too old to be educated! Jono Lancaster, prince of hope, is actively involved in projects bringing light to Treacher Collins syndrome and Adult Autism, all over the world. Jono Lancaster is an inspiration to many; he has not let his external appearance dim his inner light. Fab start to the new year.Talking to more students about how with the right attitude you can be anything you desire!